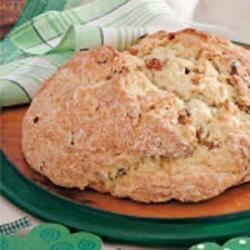 "I'm allergic to yeast, so I appreciate recipes for quick breads, biscuits and soda breads. This tender loaf that's dotted with golden raisins is great, It's one way I can enjoy toast for breakfast. --Carol Fritz of Fulton, Illinois"
In a large bowl, combine the flour, sugar, baking soda, baking powder and salt. Cut in butter until mixture resembles coarse crumbs. Add raisins. Stir in buttermilk just until moistened. Turn onto a lightly floured surface; gently knead 6-8 times. Place on an ungreased baking sheet; pat into a 7-in. round loaf. Using a sharp knife, cut a 1-in. cross about 1/4 in. deep on top of the loaf. Bake at 375 degrees F for 40-45 minutes or until golden brown. Cool on a wire rack. Nutritional Analysis: One slice equals 181 calories, 3 g fat (2 g saturated fat), 9 mg cholesterol, 265 mg sodium, 33 g carbohydrate, 1 g fiber, 4 g protein. Diabetic Exchanges: 1-1/2 starch, 1/2 fruit, 1/2 fat. This is the soda bread I remember making as a little girl. Perfect as is or with rasins. Not too moist or dry. First time making Irish soda bread and I'm not sure if it came out completely right, it is really heavy, but it tastes good. Next time I'd probably just make biscuits instead. I added dried cranberries instead of raisins. Very good but I did have to bake a little longer.